Price residential prices rose by 6.2% in the year to June 2014, up from 5% a year earlier. 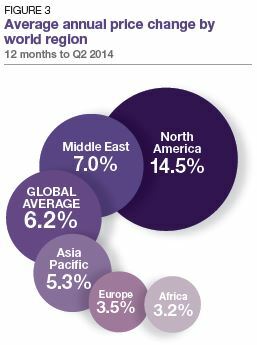 27 cities recoreded positive annual price growth in the year to June 2014, up from 21 a year earlier. Jakarta and Dublin recorded the strongest rise in prime prices in annual terms. Dubai saw annual price growth slip from 11.7% in Q1 to 6.3% in Q2. 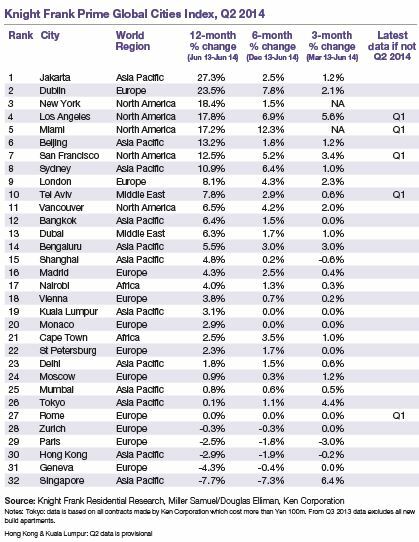 Key Asian and European capitals dominate the bottom of the annual rankings with US cities positioned at the top. We noted last quarter the improving performance of luxury homes in North America, this trend has continued in the second quarter with New York, Los Angeles, Miami and San Francisco all recording double-digit annual growth in the 12 months to June, placing them all in the top 10 rankings. In Dubai, prime prices rose by 6.3% in the year to June, down from 11.7% last quarter. The mortgage cap and the doubling of transfer fees at the end of 2013 influenced buyer activity more than forecast as new research by Knight Frank revealed around 25% of purchases are mortgage financed in the Emirate. More than previously thought.